When the new specs of the USB bus were announced, it seemed that the new version could quickly seize the market. 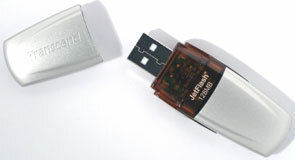 The USB 2.0 has a high throughput (40 timer greater than in USB 1.1), and although 480 Mbit/s is required just for a narrow range of devices, 12 Mbit/s is far not enough for many. With the 1/5 wider band than that of FireWire, USB 2.0 is deprived of some downsides of the latter, in particular, old USB devices can work with the new bus as well, and new devices are compatible with the old ports, so, you can use them on any computers, even though the performance drops. Well, it looks so perfect on the paper. 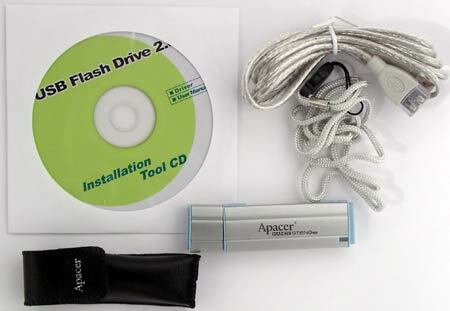 How long have we been waiting for flash drives with the USB 2.0 interface? First their release was planned for the autumn 2002, then for January this year, now for late February/ early March and in limited quantities. These devices appeared when flash exceeded the bounds of the USB, there was no a market of old devices, and the manufacturers had every chance... But they either didn't want or couldn't. 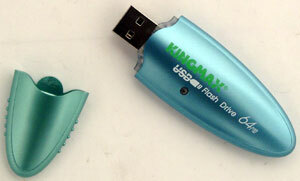 Until today we could only guess how flash drives could benefit from the USB 2.0. Well, today we finally have one such drive and all pros and cons of such models will be revealed. The supplies however will start only in a month and will be scarce. It implies deficiency and high prices. That is why we are either to wait for mass deliveries which won't start before the whole industry makes a transition to USB 2.0, or to buy a device with a usual interface. Which way is more optimal will be discussed at the end. This is the most important drive in the today's round. 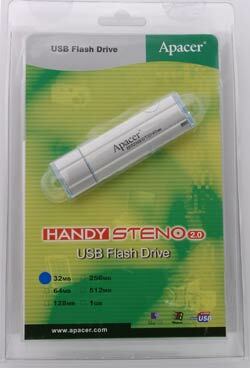 By the way, the first flash drive of the second generation that I tested was HandyDrive from Apacer. And the new era is opened with the Apacer's drive again. The name has changed a little, but its name perfectly sticks to the line of PhotoSteno, AudioSteno, MegaSteno etc. The drive is not small - 95 x 27 x 18 mm. The weight is not indicated, but it's made of aluminum instead of plastic. Well, there is some plastic as well, but it can be seen only on its ends. The LED is thus placed strangely enough, - you won't find it until you connect the drive, and the write protection lock is located on the bottom. In contrast to other drives where a USB connector is tightly attached to the main plate located inside the case, the HandySteno uses a flexible cable. The cable is hidden inside the case, and if nothing prevents from connecting the drive to PC, just open the lid and insert the port. But if the port is not so easy to reach, you can draw out the cable. Such design allows doing without an extender despite its big size. The connector is fixed tightly, though it may loose with time; on the other hand, you won't do it every day. The rigidity of the construction is strengthened by the protective cap which cover's the drive's edge as well (not just the connector). Although the device doesn't need an extender, it is supplied with it and, as expected, is entirely compatible with USB 2.0. Also there is a CD with drivers for Windows 98 (they are actually for the USB-IDE bridge from NEC), a strong neck strap and a leather case (without a belt clip though). Everything is packed into a plastic case. 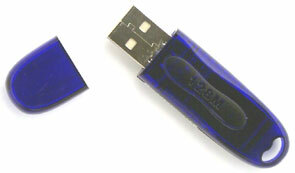 The series is the same as for the USB 1.1 drives - from 32 MB to 1GB. They didn't make a 5GB solution as such device can hardly become popular since a portable hard drive looks more interesting in this case. 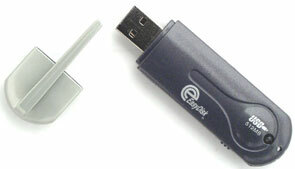 The Apacer's device is marked simply as an abstract USB 2.0. There are two colors of the panel: a silvery drive with a light green lid and a light green drive and an orange lid. In the middle is a LED which in such design looks better in this place than on the drive's end. 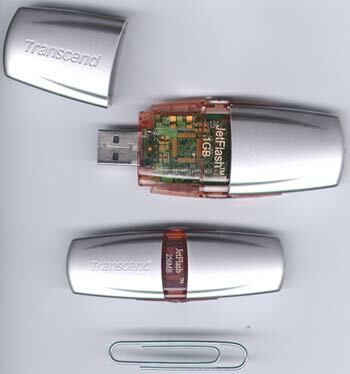 Despite its exterior the USB Flash Drive doesn't yield to man's drives: inside there is a fast controller from OTi and flash memory (32 MB to 1 GB). Its capabilities are similar to other earlier studied devices based on the same controller, in particular, Transcend JetFlash, PQI MiB and TwinMOS Mobile Disk. Unfortunately, the downsides are the same as well: you have to install the driver for a password protection. 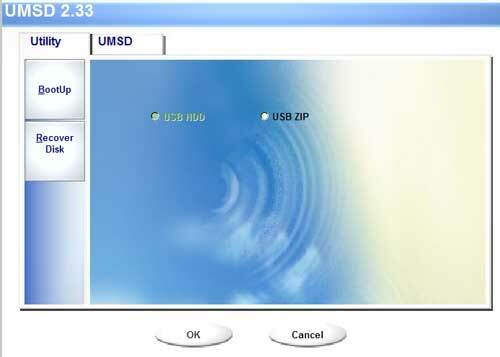 Besides, the USB Flash Drive comes with the old UMSD 1.3 which cuts down the write speed markedly. Fortunately, the device works well with the latest version 2.33 from the Luwen EasyDisk Higher Speed suite (studied below). If you are not going to use the password protection and have a newer version than Windows 98SE, no drivers are needed. 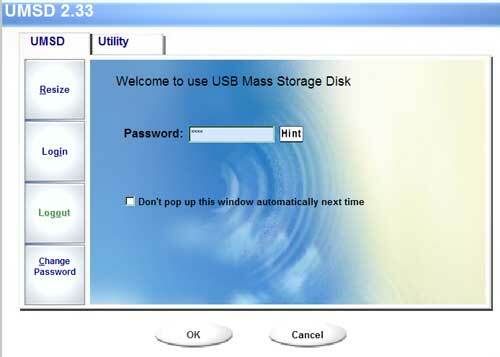 After the connection to the computer you will see a new storage device for USB in the list of devices and a noname USB Device in the list of drives. The accessory pack is standard: drive, CD with drivers, software and user guide, short (less than 10 cm) USB extender and printed guide. All the stuff is packed into a cardboard box. 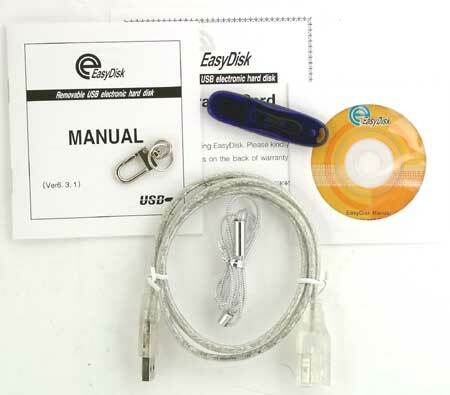 EasyDisk was always based on the SSS controller: inexpensive but with a low speed and quite big access time. It wasn't critical for junior models but it was a big disadvantage for top solutions. That is why the company decided to lift up the speed of its devices and developed Mini EasyDisk and EasyDisk Higher Speed. The latter is a usual EasyDisk of 512 MB or 1 GB (there are less sizable models as well but only two top ones are supplied), but it incorporates the OTi's controller instead of the SSS's one. These controllers are much faster; the company indicated 950 KB/s for writing and 1100 KB/s for reading. Of course, you shouldn't count on it because a 12Mbit/s USB 1.1 device usually reaches 1 MB/s at best (the bus is serial and a third of its throughput is spent for overheads), and the protocol, if not perfect, can cut it down by 15 % more (by 5% at best). The real speed will be found out a tad later. The appearance is the same: 87 x 24 x 12.7 mm and 15 g.
The accessory pack the same: drive, neck strap, USB extender, CD, printed manual, warranty card. All the stuff is packed into the same box. The only difference is the sticker Bootable Now! which is missing (because it's standard for a long time already), but there is a sticker Higher Speed. In the list of devices the drive is marked like its previous version. Well, if you don't study the software and measure the speed, you won't notice that the controller is replaced. 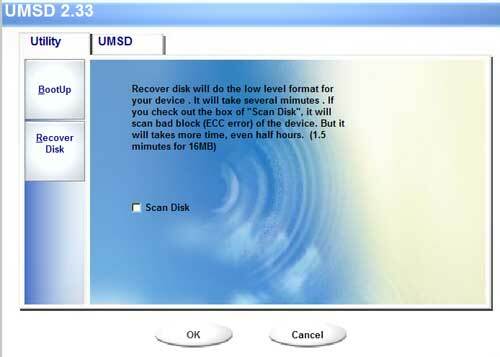 But instead of the mFormat and UDReset the CD contains UMSD 2.33. 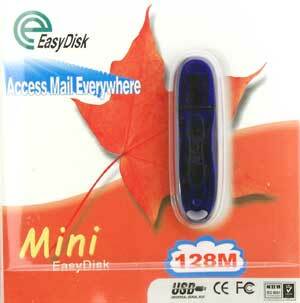 A bit later we will look at it, in particular, at Mini EasyDisk. The flash memory makers keep on increasing density of chips. As a result, the bodies of old flash drives are quite big for models of a small volume - it's possible to make them more minor. Transcend was first to step on this path, and now we have Luwen that released its Mini EasyDisk. The device attracts attention with its dimensions - 65.5 x 17 x 9 mm. 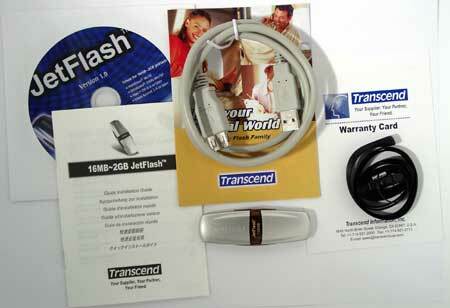 Note that its EasyDisk measured 87 x 24 x 12.7 mm and the Transcend JetFlash was of 71 x 25 x 12 mm. The Mini ED actually yields to the Multisoft USB FlashDisk (60 x 15 x 9 mm) but rather marginally: the drive almost coincides with the port in dimensions. This gadget weighs only 9 g! This baby loses only to more sizable solutions in its volume - there are versions only with 16, 32, 64 and 128 MB. A write protection lock is missing. But there must be no problems with speed thanks to the OTi's controller. The accessories are similar to what the elder brother is supplied with: USB cable, a ring with a safety hook and a neck strap, manual, warranty card and a CD (now 3.5") with software and documentation. The extender is silvery instead of gray (it won't be a surprise if it's shielded and entirely compatible with USB 2.0; it would be a nice offer from the company); the neck strap is the same. The same strap comes with the iRiver iFP players (it's marked as "IRIVER"). In the list of devices the drive is marked the same way as the ED HS. Half of the manual describes various additional software, for example, for on-the-fly compression of files when they are recorded onto the drive or for using it as a USB key. However, they have forgotten to supply it :) The CD contains the same stuff as the EasyDisk HigherSpeed has, that is why let's go right to the UMSD. We can see that the device can be divided more flexibly now: all the memory can be set as open, or the device can be divided into an open part and a closed one; besides, you can turn the drive into two discs. It's quite simple to work with the open part. It's easy to divide it into two parts, like in the 1.X versions - we just choose their size, set the password and a hint for it, and press OK. Note that the minimal size of each part is 1 MB because the open part contains the UMSD (to get access on another computer) and a smaller size makes no sense for the closed part as well. The last case is more interesting. We can divide the drive into two independent parts and then divide one of them into open and protected parts. The divided drive is marked differently: one USB Mass Storage Controller brings about two Disc Devices like Easy Disk. Each disc is given its own letter for better control over the contents, i.e. for the same purpose hard drives are partitioned (by the way, 5 years ago 1 GB was considered enough for a hard drive, and now the same memory can be housed in a flash drive). If the computer the protected drive connects to has the UMSD you will see a special window requesting the password right after you connect the drive (though you can cancel its automating pop-up). If the UMSD is not installed, you must start the installer from the open part. On entering the password the open part will disappear, and you will see the contents of the protected one under the same name. Using the other buttons you can switch from the protected part to the open using Logout or change the password. The third method of partitioning is convenient because the dedicated drive will be available irrespective of what part we are working with. Now the second tub - Utility. The device can be made bootable. It's possible to choose under Windows 98 how to boot from the device: as from a USB hard drive or as from a USB-ZIP; under the other operating systems none of them works. The possibility of low-level formatting of the drive is much more handy; it's accomplished with the button Recover Disk. You can just format the drive (if for example you forget the password), or you can test it for faulty blocks. There were no problems in the first and second modes, but when I partitioned the drive using the third method the computer rebooted twice (in spite of the Windows XP!) after I entered the password to get into the protected part. So, you'd better wait for a newer version if you want to make two logical drives out of one physical. On the other hand, you don't need to disable USB or FireWire drives when formatting this one. The list of the devices has precise information on the device including the memory size. The dimensions of the model depend on its size - models with 16, 32, 64, 128 and 256 MB measure 73 x 25 x 11 mm and weigh 15 g, while the 512 MB, 1 or 2 GB measure 88 x 33 x 15 mm at 24 g of weight. Now you can wear the drive as it has a strap hole (the drive comes with the neck and wrist straps). 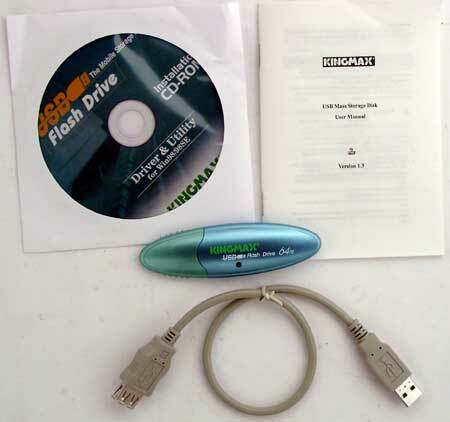 There is also a USB extender, user manual, a leaflet of flash products and CD. The cardboard box is replaced with a compact plastic one. Apart from a write protection lock there is one more marked as FDD/ZIP. The software will tell you what it's meant for. This is a new version of the mFormat. There are some similarities with the old versions (by the way, the new program doesn't work with old SSS based controllers, for example, EasyDisk or JetFlash), - as before it uses directories UTI_DIR and XP_BOOT. But there are new features as well, for example, you can divide the drive into two parts - open and protected one (though you can also protect the whole device as before). Besides, each part can be made bootable. 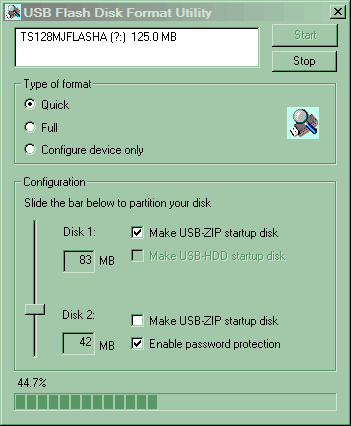 There are three ways for the open part: USB-ZIP (standard for most flash drives), USB-HDD (in this case you can format it only under the Windows 98) and USB-FDD (if you make the size equal to 1.44 MB). The other part can be set only as USB-ZIP, provided that this version is not chosen for the first one. The booting and protection are disabled by default, and the whole drive is open. It's also possible to make the first part bootable and the other protected. Also, you can make the first part's size equal to 1.44 MB and set it as USB-FDD, the other can be protected with a password and fixed as USB-ZIP. How should the drive know where to boot from? 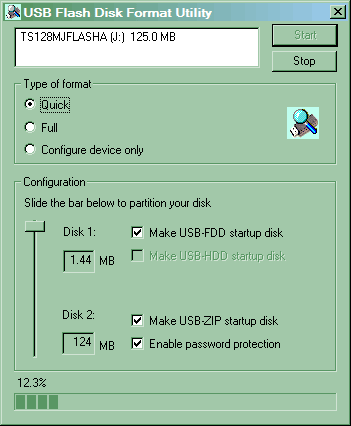 Here is the slider: when moved to FDD the drive will boot from the first part, when to ZIP - from the second. 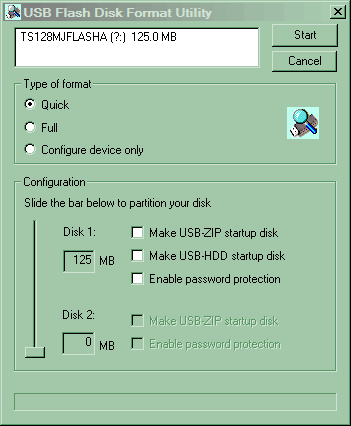 On the whole, for booting from a virtual floppy drive the slider should be shifted to FDD, even if the second part is not bootable. 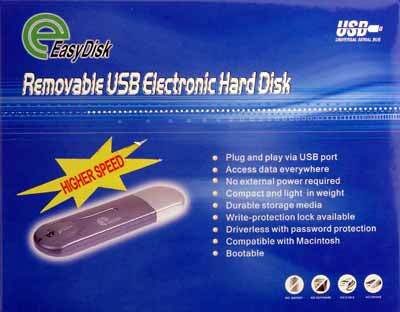 In all other respects, it is similar to the EasyDisk and JetFlash of large volumes. The equipment is standard: VIA KT333 mainboard with 8233A south bridge and integrated USB 1.1 controller. The tests were carried out under the Windows XP Pro Rus SP1. We publish only the HD Tach results because this utility provides the most precise data, and other measurement methods do not contradict. As always, let's start with the access time. All three OTi based controllers go on a par; their access time coicides with the earlier tested models on this chip. The SSS in the JetFlashA has brilliant performance, as expected. It's a bit more efficient than the other SSS based solutions. But the new-comer has the same scores as the OTi solutions despite the non-standard mode. With a very small breakaway the EasyDisk Higher Speed outscores the former leader TwinMOS Mobile Disk. Of course, it's unable to reach the promised 1100 and 950 KB - it's hard to fish out over 850 KB/s from USB. The scores of the Mini EasyDisk are more modest but they are good as well, it keeps up with MiB and JetFlash of the small size. Well, the old EasyDisk line can be taken out of production. Those who want 256 MB are in a difficult situation now because for the Mini the maximum size is 128 MB and the HS's minimal size is 512 MB. Luwen has to tackle this problem as quickly as possible. Although the JetFlashA outpaces other SSS based models in reading and beats the old EasyDisk markedly in recording, it lags behind the SSS based JetFlash by 150 KB/s, not to mention the OTi's solutions. The access time is not small, which will certainly slow down operation with numerous small files. Well, the specs are deceptive: it's not a competitor for the JetFlash. The JetFlashA is a very flexible but too slow device. The HandySteno 2.0 takes the third position; it's just a tad behind the Luwen and TwinMOS but outdoes the other OTi based drives not to mention the rest. 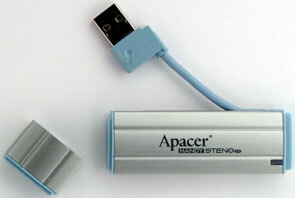 So, users of flash drives with the USB 2.0 interface won't lose anything at least (anyway, it's so for Apacer devices). USB 2.0 - what's new? The first part of the tests isn't of much interest because we knew it before that the OTi controllers are faster than the SSS. The only useful fact is that the devices meant for USB 2.0 work with the old bus at the level of best flash drives of USB 1.1, but it was to be expected (because both the controller and the memory chips are designed to achieve much higher performance). And now let's connect the flash drives to the additional controller USB 2.0 on the NEC chip instead of the mainboard's port. Since we found out that usage of the USB 1.1 flash drives on the USB 2.0 controller gives no gain, we won't attach all the drives - the Luwen EasyDisk Higher Speed, a leader in the tests on the old controller's version, will be enough. The bus will work in the emulation mode, but we will have a chance to compare more or less precisely two devices of different generations in approximately equal conditions. HandySteno shows superb access time - less than 1 ms. It seems that in case of operation at High Speed they managed to cope with one of the shortcomings of USB - regular delays of 1-2 ms because of the necessity to switch the bus from delivering service data to transfer of useful data. On the other hand, the NEC is also a fast chip - we won't see anything similar on the integrated VIA8235 or Intel ICH4 controllers. In the end, the Luwen responds faster by 3 ms. 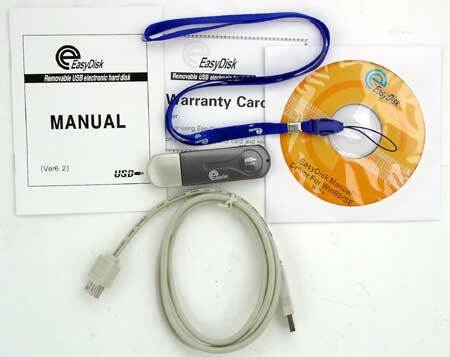 The EasyDisk reads a little quicker and writes much slower because of the replaced controller. But even if the recording were not slower but faster, say, by 50 or 100 KB/s with the respective read speed increase it wouldn't affect the relative length of the bars on the diagram. The best samples with the USB 1.1 interface do not reach even 1 MB/s while the USB 2.0 drives have it several MB/s! The day when the speed will be tens of megabytes per second is just around the corner. I was really surprised at such a disbalance between the read and write speeds in case of the HandySteno. After the flash cards I thought that the read speed would have been 1.5 times lower and the write speed 1.5 times higher. But then I remembered that the HandyDrive behaved the same way as well: the drive showed excellent scores unsurpassed by anyone so far (over 900 KB/s) in reading, but the write speed was twice lower. Today such speed is awfully low. 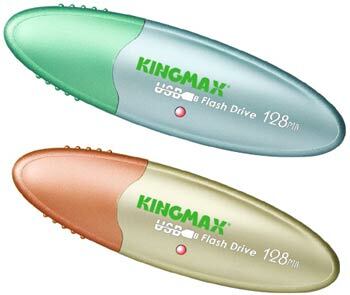 It's quite possible that the situation will take place again, and other USB 2.0 flash drives will perform better than the HandySteno 2.0 in recording but they can turn out to be slower in reading. But maybe the read speed will be the same - it is higher than that of the cards only because here are fewer intermediaries, but it will be clear only in the tests of other devices of the new generation. The scores of the HandySteno are of the revolutionary nature. Probably, it won't remain a leader for a long time because now the manufacturers have got an opportunity to gear up performance not by kilobytes but by megabytes; but the key thing is that the USB 2.0 drives are several times faster than their predecessors. If both were in stock and didn't differ except the speed I would certainly recommend to pay no attention to the USB 1.1 drives. But it's different: a bird in the hand is worth two in the bush. Let's compare the two options. High speed is nice. Just imagine: you need to take home a DOC file of 1 MB. You will write it on the EasyDisk at 1.125 s, and on the HandySteno at 0.45. Well... it doesn't impress :) Let's consider another example. 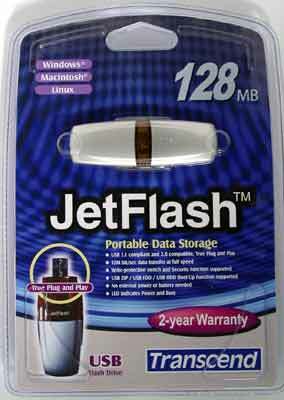 Imagine you've got a lot of music downloaded at work and you want to take it home with a 64 MB flash drive. The EasyDisk will be filled up at 80 s, and the HandySteno at 30. At home you will transfer it at 80 and 9 s respectively. Hmm... I think it will take much more time to create a directory for it. There can also be a problem with USB 2.0 at your work. Well, I'm not a good publicity agent :) Actually, the 32 and 64 MB drives are selling best of all, though the demand is gradually shifting toward 64 and 128 MB. But even in the last case it's not that terrible to fill up the USB 1.1 drive, not to mention transportation of office documents. Drives of 512 MB and higher where the speed is critical (because they are bought exactly for large data volumes) are still produced in scarce quantities. Also, take a look at the software supplied: everything you dream of for USB 1.1 drives and a sole driver for Windows 98 for the HandySteno (the situation might change until its official release, but the package and the CD look very similar to the release version). Visually, next to the Mini EasyDisk, this featherweight, the massive HandySteno looks like a hard drive of 1981 next to a modern notebook's one :) What a girl would perfer is a rhetorical question. 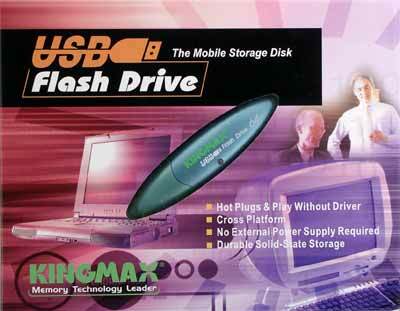 But I don't mean that USB 2.0 is not needed for flash drives. I just want to say that the competition among the devices with the old bus started long ago, none of the drives was able to outrun solutions from other manufacturers, that is why other methods were to be tried. Remember that the first drives required drivers for all OSes? Half a year later we got "driver-free" drives, then the password protection became a standard function, but the utilities for creating a bootable drive are not standard yet - you may fail to make some models bootable with only the Windows XP. Software was improved and debugged with time, - just take the fact that the write speed went up by 1.5 times with the shift from UMSD 1.X to 2.X. Now we will take almost the same way; it's good though that the drivers are needless. At first such devices will be in huge demand because they are awaited much and mass production is not promised at the beginning. But after that the market will be saturated and the competition with all its advantages will come by. So, it's much more than a month needed: a month till the release, then it will take time for the retail price to go down and then for the software to be corrected. All this time you can nicely use one of the USB 1.1 drives. So, if you need badly a high speed (you are going to write/read hundreds of megabytes at a time) and you can wait a little, then wait - the speeds with the new interface has much better speed than the old samples. If you need just a compact and convenient device to replace your floppy drive, then you'd better choose one of the already available flash drives on the market. Their speed is enough for most users, they are handy and they sell at very attractive prices.